The national airlines carrier of Bhutan is Druk Air, which started its operation on 14th of January in the year 1983. 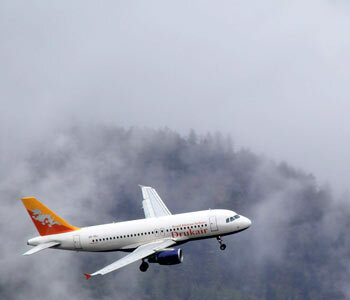 This historical day mark the beginning of aviation in the Kingdom of Bhutan. The approvals to start the airport in the valley of Paro were sanctioned in the year 1968, but the first aircraft Dornier 228-200 landed in the year 1983. The Paro airport situated in a deep valley is very scenically located with the high surroundings hills. It is one the most difficult airports to land in which is why extremely stringent measures are taken to get pilots of the highest caliber who have to pass very rigid tests in order to fly to the Paro airport. The Progress of Dunk Air was seen by 1988, after which the air route network was increased to link Paro to cities like New Delhi, Bangkok and Kathmandu besides the existing link with Kolkata and Dhaka. The pace of progress, though slow, did build confidence in people to use air as a mode of transport. The much increased demand gave an impetus to Druk air and by 2004, the Royal government of Bhutan upgraded their fleet of aircrafts and since then, there�s been no looking back.